2017 has been a doozy. It was the year that I learned that a yam is a sweet potato. And a sweet potato is, in fact, not a yam! I apologize in advance if this is old news to you but in all seriousness, I always thought the two were one and the same. But clearly, I’ve been living under a rock. A big, starchy yam rock. Regardless, I’m just relieved to say, with pride, that we’re preparing sweet potatoes today in a way that will make you want eat them like this all season long. Gratin-style. 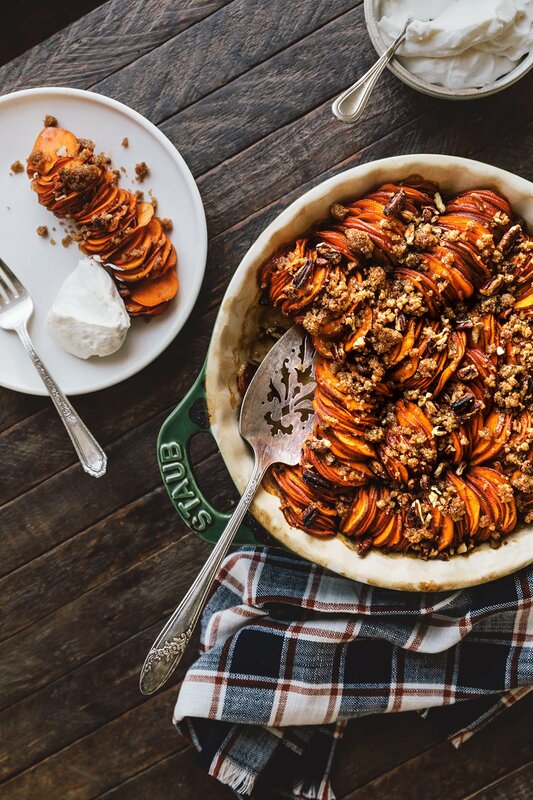 Just like our potato gratin, the sweet potatoes are baked to tender perfection in mixture of heavy cream and all the warm and cozy spices like cinnamon and nutmeg, and topped off with a nutty and buttery streusel topping. If I were you, I wouldn’t wait to devour this until dessert. 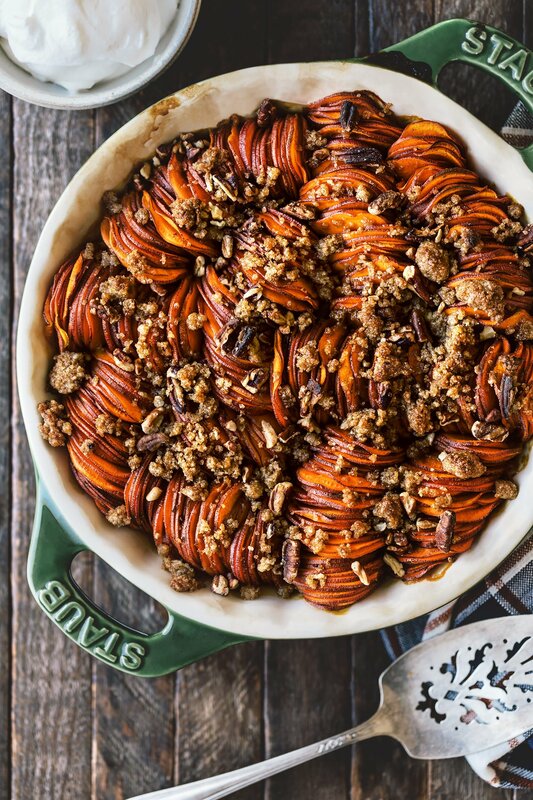 Trust me, you’ll want to bring it out to your Thanksgiving table as a side dish. It’s that good. Hey there! Can you make this and let it set overnight in the refrigerator before baking the next day? Thanks! Hi! Looks great. Do you peel the potatoes? Silly question but don’t see in recipe. 🙂 excited to make! Have you tried substituting to make it dairy free? Could I substitute the cream and butter with coconut cream and oil to make it dairy free? I haven’t tried it but it sounds like it would work and actually be tasty! Can’t wait to try it out. – this looks decadent but delicious! Thanks so much! Made this yesterday for Thanksgiving: a beautiful turn-on-its-head rendition of the mashed sweet potato classic. I put a little more streusel and marshmallows to get that classic, sugar-sweet flavor. Definitely a hit at our table. I’m so glad it turned out great! Thanks for sharing! Since you made this… did you find 3lbs if potatoes were enough? This is like 3 potatoes… looks like so much more than that! Oh wow, this looks decadent but delicious! Can’t wait to try it out. The photos are beautiful too. This looks great! Do you discard the cream mixture after tossing the potatoes or do you pour it over the arranged potatoes for baking? Thanks, really looking forward to trying this! @Alyssa I discard it because I actually like soaking the potatoes in the mixture for at least half an hour. But you can definitely pour a bit of the cream over the graton before baking if your short on time or want a bit more creaminess. Do you add the streusel when serving? Or can it be done before? @Leslie the struesel is added towards the end of baking, uncovered for about 15 minutes. It has flour in it so you’ll need to bake it.